the unwelcome change to Paul's labors. For upwards of three years, Ephesus was the center of Paul's work. A flourishing church was raised up here, and from this city the gospel spread throughout the province of Asia, among both Jews and Gentiles. The apostle had for some time contemplated another missionary journey. He desired again to visit the churches in Macedonia and Achaia, and after spending some time at Corinth, to go to Jerusalem, after which he hopedostle had for some time contemplated another missionary journey. He desired again to visit the churches in Macedonia and Achaia, and after spending sstle had for some time contemplated another missionary journey. He desired again to visit the churches in Macedonia and Achaia, and after spending sstle had for some time contemplated another missionary journey. He desired again to visit the churches in Macedonia and Achaia, and after spending sto preach the gospel at Rome. In pursuance of his plan, he sent Timothy and Erastus before him into Macedonia; but feeling that the cause in Ephesus still [p. 141] demanded his presence, he decided to remain till after Pentecost. An event soon occurred, however, which hastened his departure. The month of May was specially devoted to the worship of the goddess of Ephesus. The universal honor in which this deity was held, the magnificence of her temple and her worship, attracted an immense concourse of people from all parts of the province of Asia. Throughout the entire month the festivities were conducted with the utmost pomp and splendor. The gods were represented by persons chosen for the purpose, who were regarded as objects of worship, and were honored by processions, sacrifices, and libations. Musical contests, the feats of athletes, and the fierce combats of men and beasts, drew admiring crowds to the vast theaters. The officers chosen to conduct this grand celebration were the men of highest distinction in the chief cities of Asia. They were also persons of vast wealth, for in return for the honor of their position, they were expected to defray the entire expense of the occasion. The whole city was a scene of brilliant display and wild revelry. Imposing processions swept to the grand temple. The air rung with sounds of joy. The people gave themselves up to feasting, drunkenness, and the vilest debauchery. This gala season was a trying occasion to the disciples who had newly come to the faith. The company of believers who met in the school of Tyrannus were an inharmonious note in the festive chorus. Ridicule, reproach, and insult were freely heaped upon them. By the labors of Paul at Ephesus, the heathen worship had received a telling blow. There was a perceptible [p. 142] falling-off in attendance at the national festival, and in the enthusiasm of the worshipers. The influence of his teachings extended far beyond the actual converts to the faith. Many who had not openly accepted the new doctrines, became so far enlightened as to lose all confidence in heathen gods. The presence of Paul in the city called special attention to this fact, and curses loud and deep were uttered against him. Another cause of dissatisfaction existed. It had long been customary among heathen nations to make use of small images or shrines to represent their favorite objects of worship. Portable statues were modeled after the great image of Diana, and were widely circulated in the countries along the shores of the Mediterranean. Models of the temple which enshrined the idol were also eagerly sought. Both were regarded as objects of worship, and were carried at the head of processions, and on journeys and military expeditions. An extensive and profitable business had grown up at Ephesus from the manufacture and sale of these shrines and images. Those who were interested in this branch of industry found their gains diminishing. All united in attributing the unwelcome change to Paul's labors. 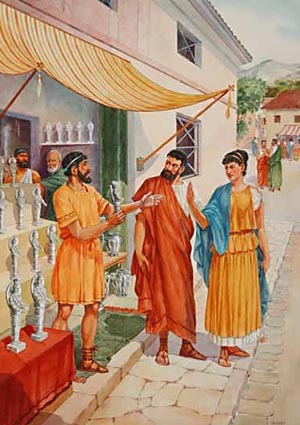 Demetrius, a manufacturer of silver shrines, called together the workmen of his craft, and by a violent appeal endeavored to stir up their indignation against Paul. He represented that their traffic was endangered, and pointed out the great loss which they would sustain if the apostle were allowed to turn the people away from their ancient worship. He then appealed to their ruling superstition, saying: "Moreover ye see and hear, that not alone at [p. 143] Ephesus, but almost throughout all Asia, this Paul hath persuaded and turned away much people, saying that they be no gods which are made with hands; so that not only this our craft is in danger to be set at naught, but also that the temple of the great goddess Diana should be despised, and her magnificence should be destroyed, whom all Asia and the world worshippeth." This speech acted as fire to the stubble. The excited passions of the people were roused, and burst forth in the cry, "Great is Diana of the Ephesians!" A report of the speech of Demetrius was rapidly circulated. The uproar was terrific. The whole city seemed in commotion. An immense crowd soon collected, and a rush was made to the workshop of Aquila, in the Jewish quarters, with the object of securing Paul. In their insane rage they were ready to tear him in pieces. But the apostle was not to be found. His brethren, receiving an intimation of the danger, had hurried him from the place. Angels of God were sent to guard the faithful apostle. His time to die a martyr's death had not yet come. Failing to find the object of their wrath, the mob seized two of his companions, Gaius and Aristarchus, and with them hurried on to the theater. Paul's place of concealment was not far distant, and he soon learned of the peril of his beloved brethren. His courage was in keeping with the occasion. He was ever ready to press to the front in the battle for his Master. Forgetful of his own safety, he desired to go at once to the theater, to address the rioters. But his friends refused to permit him thus to sacrifice himself. Gaius and Aristarchus were not the [p. 144] prey that the people sought; no serious harm to them was apprehended. But should the apostle's pale, care-worn face be seen, it would arouse at once the worst passions of the mob, and there would not be the least human possibility of saving his life. Paul was still eager to defend the truth before the multitude; but he was at last deterred by a message of warning from the theater. Several of the most honorable and influential among the magistrates sent him an earnest request not to venture into a situation of so great peril. This proof of the regard in which Paul was held by the leading men of Asia was no mean tribute to the sterling integrity of his character. The tumult at the theater was continually increasing. "Some cried one thing, and some another; and the more part knew not wherefore they had come together." From the fact that Paul and some of his companions were of Hebrew extraction, the Jews felt that odium was cast upon them, and that their own safety might be endangered. Wishing it to be understood that they had no sympathy with the Christians, they thrust forward one of their own number to set the matter before the people. The speaker chosen was Alexander, one of the craftsmen, a coppersmith, to whom Paul afterward referred as having done him much evil. Alexander was a man of considerable ability, and he bent all his energies to direct the wrath of the people exclusively against Paul and his companions. But the crowd were in no mood to make nice distinctions. Seeing that Alexander was a Jew, they thrust him aside, the uproar continually increasing as all with one voice cried out, "Great is [p. 145] Diana of the Ephesians!" This cry continued for two hours. At last there came a momentary silence, from sheer exhaustion. Then the recorder of the city arrested the attention of the crowd, and by virtue of his office obtained a hearing. By his prudence and good judgment he soon succeeded in quieting the excitement. He met the people on their own ground, and showed that there was no cause for the present tumult. He appealed to their reason to decide whether the strangers who had come among them could change the opinions of the whole world regarding their ruling goddess. Said he: "Ye men of Ephesus, what man is there that knoweth not how that the city of Ephesus is a worshiper of the great goddess Diana, and of the image which fell down from Jupiter? Seeing then that these things cannot be spoken against, ye ought to be quiet, and to do nothing rashly." He bade them consider that Paul and his companions had not profaned the temple of Diana, nor outraged the feelings of any by reviling the goddess. He then skillfully turned the subject, and reproved the course of Demetrius: "Wherefore if Demetrius and the craftsmen which are with him have a matter against any man, the law is open, and there are deputies; let them implead one another. But if ye inquire anything concerning other matters, it shall be determined in a lawful assembly." He closed by warning them that such an uproar, raised without apparent cause, might subject the city of Ephesus to the censure of the Romans, thus causing a restriction of her present liberty, and intimating that there must not be a repetition of the scene. Having by this [p. 146] speech completely tranquilized the disturbed elements, the recorder dismissed the assembly. The words of Demetrius reveal the real cause of the tumult at Ephesus, and also the cause of much of the persecution which followed the apostles in their work of promulgating the truth. "This, our craft, is in danger." With Demetrius and his fellows, the profitable business of image-making was endangered by the teaching and spread of the gospel. The income of pagan priests and artisans was at stake; and for this reason they instituted the most bitter opposition to the apostle, and refused to receive or investigate the new religion, which would have made them wise unto salvation. Paul's labors in Ephesus were at length concluded. He felt that the excitement which prevailed was unfavorable to the preaching of the gospel. His heart was filled with gratitude to God that his life had been preserved, and that Christianity had not been brought into disrepute by the tumult at Ephesus. The decision of the recorder and of others holding honorable offices in the city, had set Paul before the people as one innocent of any unlawful act. This was another triumph of Christianity over error and superstition. God had raised up a great magistrate to vindicate his apostle, and hold the tumultuous mob in check. Paul's ministry in Ephesus had been a season of incessant labor. of many trials, and deep anguish. He taught the people in public and from house to house, instructing and warning them with many tears. He was continually opposed by the unbelieving Jews, who lost no opportunity to stir up the popular feeling against him. Again and again he was attacked by the mob, and subjected to insult and abuse. By every means which they could employ, the enemies of truth sought to destroy the effects of his labor for the salvation of men. And while thus battling against opposition, and with untiring zeal pushing forward the gospel work and guarding the interests of a church yet young in the faith, Paul was bearing upon his soul the burden of all the churches. Nor was he released even from the tax of physical labor. Here, as at Corinth, he worked with his own hands to supply his necessities. In weariness and painfulness from unceasing toil and constant danger, enfeebled by disease, and at times depressed in spirits, he steadfastly pursued his work. The news which he received, of apostasy in churches of his own planting, caused him deep anguish. He greatly feared that his efforts in their behalf would prove to have been in vain. Many a sleepless night was spent in prayer and earnest thought, as he learned of the new and varied methods employed to counteract his work. As he had opportunity, he wrote to the churches, giving reproof, counsel, admonition, and encouragement, as their state demanded. In his epistles the apostle does not dwell on his own trials, yet there are occasional glimpses of his labors and sufferings [p. 148] in the cause of Christ. Stripes and imprisonment, cold and hunger and thirst, perils by land and sea, in the city and in the wilderness, from his own countrymen, from the heathen, and from false brethren,—all these he endured for the truth's sake. He was defamed, reviled, "made the offscouring of all things," "perplexed, persecuted, troubled on every side," "in jeopardy every hour," "alway delivered unto death for Jesus' sake." Amid the constant storm of opposition, the clamor of enemies, and the desertion of friends, the intrepid apostle at times almost lost heart. But he looked back to Calvary, and with new ardor pressed on to spread the knowledge of the Crucified. He was but treading the blood-stained path which Christ had trodden before him. He sought no discharge from the warfare till he should lay off his armor at the feet of his Redeemer. Eighteen centuries have passed since the apostle rested from his labors; yet the history of his toils and sacrifices for Christ's sake are among the most precious treasures of the church. That history was recorded by the Holy Spirit, that the followers of Christ in every age might thereby be incited to greater zeal and faithfulness in the cause of their Master. How does this hero of faith tower above the self-indulgent, ease-loving men who are to-day crowding the ranks of the ministry. When subjected to the ordinary difficulties and trials of life, many feel that their lot is hard. But what have they done or suffered for the cause of Christ? How does their record appear when compared with that of this great apostle? What burden of soul have they felt for the salvation of sinners? [p. 149] They know little of self-denial or sacrifice. They are indebted to the grace of Christ for all the excellences of character which they possess, for every blessing which they enjoy. All that they are, and all that they have, is the purchase of the blood of Christ. As the servants of Christ encounter opposition and persecution, they should not permit their faith to grow dim or their courage to fail. With Christ as a helper, they can resist every foe, and overcome every difficulty. The same obligation rests upon them which impelled the apostle to his unwearied labors. Only those who emulate his fidelity, will share with him the crown of life. Click here to read the next chapter: "Paul to the Corinthians"